Ever get the feeling that you're juggling too many things at once? Sometimes I feel like I'm getting a lot done, but at the end of the day, I've just done a little bit of everything, and not completed a single thing. Certainly, when we all do our piece, it makes big jobs smaller and we can eventually get everything done. But is breaking up tasks and multitasking the most efficient way to manage projects? According to the Multitasking Name Game, focusing on one thing at a time is more efficient. Or you can try your odds at the Multitasking Test, if you think you're an expert at juggling multiple things! But first, you can check out the simulation below. I found this simulation on Slideshare that illustrates the inefficiencies in managing multiple projects at the same time. It's actually a simple pen and paper lean simulation that you can do yourself, or with a group. Writing letters in blue marker. 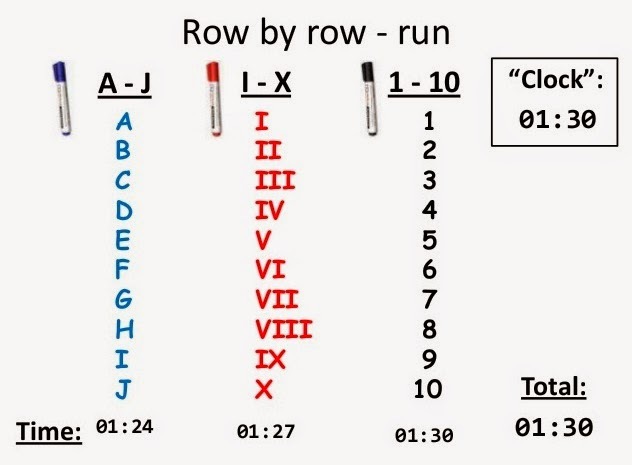 Writing Roman numerals in red marker. Writing numbers in black marker. Step One: Complete one row at a time, writing one letter from each column. This simulates working on all three projects simultaneously. With a stopwatch, time how long it takes to complete all three columns and each one. Step Two: Write each column at a time, completing the blue first, then the red and finally the black. Again, time how long it takes to complete each column and the entire page. I think you can see where this is going. . . The slide show below simulates the whole activity, without you having to lift a marker or three! Just click the arrow to go from slide to slide. I think this little simulation is perfect to show how transactional work or office work can be made more efficient. It's also perfect for design activities, where specific steps need to be completed before the whole project can move forward. Everyone can focus to get that next step completed, like the way kanban is used in software development. 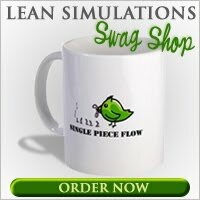 For more lean games and simulations like this, check my large collection of lean simulations! Thanks for the video, Lean Lab. I've embedded in the post above! Great Article i really it Send gifts to Pakistan . I read these type of informatics articles specially on internet. LIMO CABS BANGALORE is a competent name among bangalore car taxi rental hire agencies in the city. wide range of customers from individual clients.